Accelerate your Blender rendering with the computing power of the swarm. Monetize your hardware by providing computing power to the swarm. Pay and get paid in Bitcoin, the independent, decentralized Internet currency. BitWrk brings powerful distributed rendering. If you're a 3D artist using Blender to produce 3D pictures and animations, then BitWrk might be the right tool for you. By dispatching your work to a swarm of computers on the Internet, BitWrk reduces your rendering times significantly. 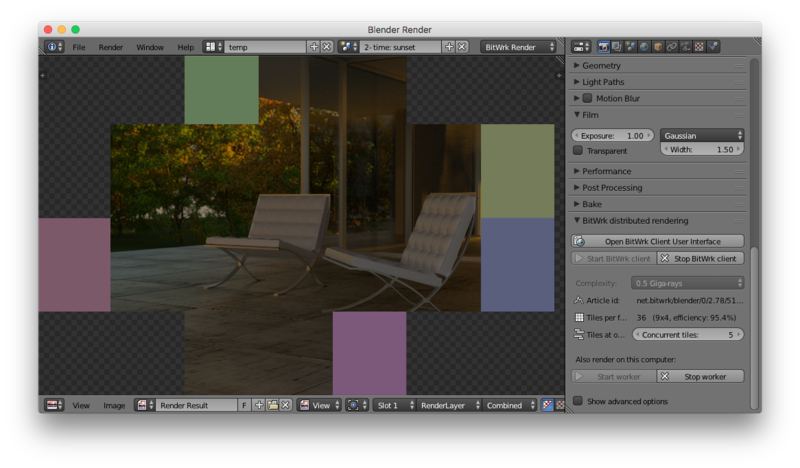 Blender rendering a scene using the render_bitwrk add-on. The flat blocks in the image are work units that are currently being dispatched to the BitWrk service. Blender is a free yet professional 3D rendering software. It has been used for animated movies such as Caminandes and many more. BitWrk includes an add-on enabling Blender to dispatch rendering jobs to the BitWrk client software, wich will then publish them to the BitWrk service. By cutting render jobs into tiles ouf roughly equal rendering complexity and dispatching those to multiple computers at once, BitWrk is able to accelerate even single-frame renderings. This works with all Blender projects that use the Cycles rendering engine. BitWrk allows you to switch sides and be a part of the swarm. By sharing your hardware, you will be able to make money with BitWrk. This is what makes BitWrk unique. Like in a stock exchange, you decice what price to sell for. BitWrk is unique in that it allows you to have your computer accept work from others. This feature is what makes BitWrk an open marketplace. You decide what price your computer works for. On successful completion of a task, your account is credited with that amount. In this screenshot, a worker is waiting for Blender rendering tasks which it sells for 100 μBTC each. Employing the famous Internet currency makes BitWrk a new kind of cloud computing, firmly in the hands of the community. BitWrk depends on its community, and you're invited to be a part of it. Try buying some Blender rendering for an amount as small as 1 mBTC. Bitcoin enables you to send money, via your computer or cell phone, to anybody else on the Internet. In order to buy computing power on BitWrk, you will need to either earn Bitcoin by selling computing power on BitWrk, or purchase some Bitcoin beforehand. Luckily, there are exchanges where you can buy Bitcoin for Dollars, Euros etc. If you haven't used Bitcoin before, start here: bitcoin.org. This screenshot shows the Bitcoin depositing process. Sending Bitcoin to the right address from your cell phone is easy thanks to QR-codes. BitWrk proudly presents version 0.6.0 "Mars", featuring major new features and enhancements for Blender users. Why not give it a try today and enjoy some FREE Blender rendering? Update Apr 22, 2018: Maintenance release 0.6.4 fixes several bugs and adds user interface for local GPU rendering. BitWrk was presented at this year's BlenderDay in Stuttgart on Aug 12. "One of the more futuristic ideas for Bitcoin that has been floated around is that it could become the currency for payments between machines on some new kind of world computer. BitWrk is a project that has turned this concept into a reality (…)"
Read more on Bitcoin Magazine. Jonas Eschenburg, developer of BitWrk, held a Lightning talk on BitWrk at the 31st annual Chaos Communication Congress (31C3). In his 5 minute talk, he explained the concepts behind BitWrk and gave an outlook on upcoming events. This chart displays activity in the last 24 hours. It works like a stock exchange. If demand for Blender rendering is low, prices fall. If demand is high, prices may rise. If you're seeing nothing, then there hasn't been any activity during the last 24 hours, which probably means that you have exclusive access to the swarm's rendering power. What do I need to run BitWrk? The BitWrk client software runs on Windows, Mac OS X and Linux. The Blender add-on needs at least Blender 0.76. Where can I register a BitWrk account? You don't have to. When you start BitWrk for the first time, it creates an account for you. It will keep a key file (privatekey.wif) to identify itself to the BitWrk service. Your account will be named something like 1MwvTNehPz7U5XYn3h1G7LVPANv3GFq6JR. This does not only look like a Bitcoin address, it is one. BitWrk's algorithms are based on Bitcoin technology. The BitWrk client software is free (in fact, both client and server are Open Source). Unless there are participants offering work for free (which is currently the case), the idea is to bid a very small amount of money per work unit. The service itself will deduct a small fee (currently 3% but subject to change) off the price of each transaction. Do I need money to try out BitWrk? No. It is currently possible to bid 0 BTC for Blender rendering, and there are servers selling for this price. Can I use BitWrk for privacy-sensitive projects? While BitWrk doesn't make it particularly easy to do so, a seller might copy the work data you transmit. This is a problem inherent to all community-driven rendering services. How can I transfer Bitcoin into and out of BitWrk? In the client user interface, switch to the "Accounts" page. 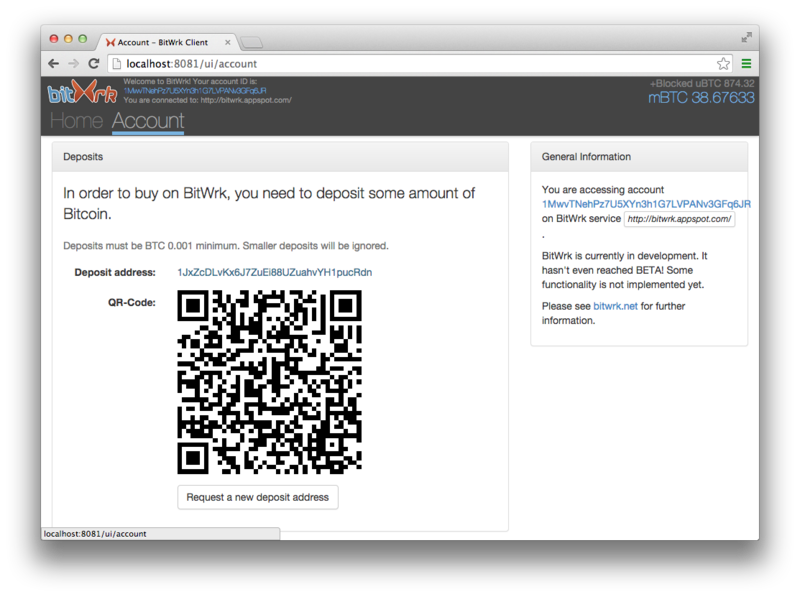 For transferring money into BitWrk, you need to request a deposit address first. This usually takes a couple of seconds. Bitcoins transferred to that address will be credited to your account after one hour on average. 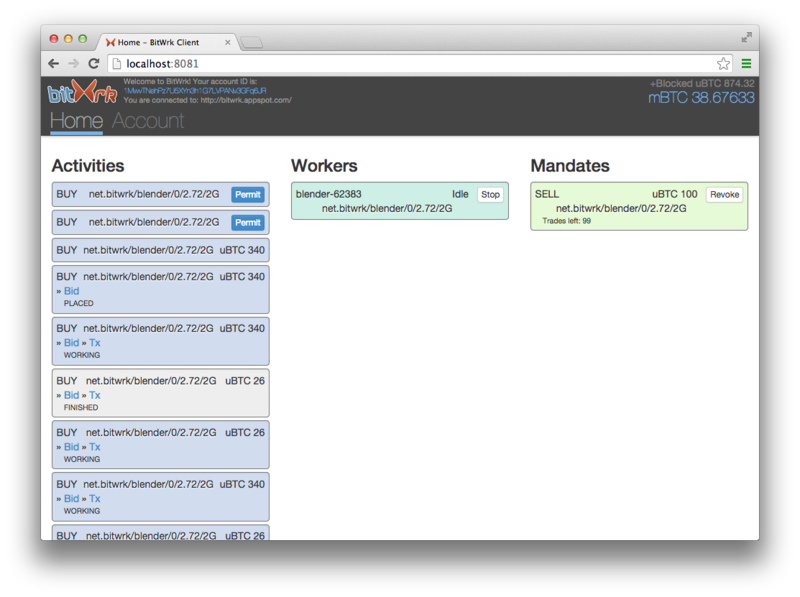 Withdrawals from BitWrk are planned, but not implemented yet. If withdrawals from BitWrk aren't implemented yet, how can I get my money back? First of all, please make sure not to put any large amounts of money on your BitWrk accounts. Keep your deposits small in order to avoid the situation, until withdrawals can be triggered with the Bitcoin client. Until then, please ask the developer, Jonas Eschenburg, jonas (at) bitwrk.net, to send you the money on your account. What's that animation on this page? Apart from looking pretty, it is actually a simulation of BitWrk's possible, future user behavior rating system.